I have completed numerous public art commissions over the last 25 years. These were all jobs I won through public art competitions. 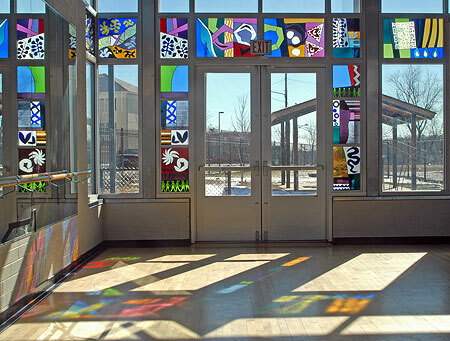 Due to the nature of public art, where municipalities set aside a small percentage of their new construction budget for art, I have designed and built stained glass windows for many libraries, health centers, recreation buildings and schools, all secular and institutional locations. 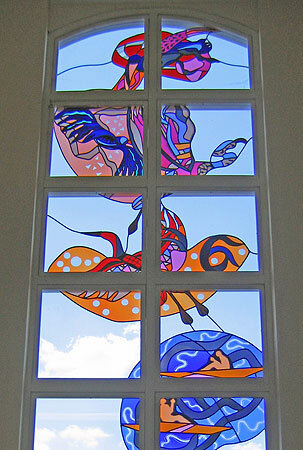 I have done several fused glass murals as well. I would love to continue this work and I am also interested in designing glass for hotels, restaurants, religious buildings and private homes and any other clients who don’t fall into the public art realm. Stained glass is an architectural art, at its best when it is integrated into a building. Because I was an architect (I received a Masters of Architecture from the Harvard Graduate School of Design) I am very sensitive about how the glass relates to the setting and enhances it. 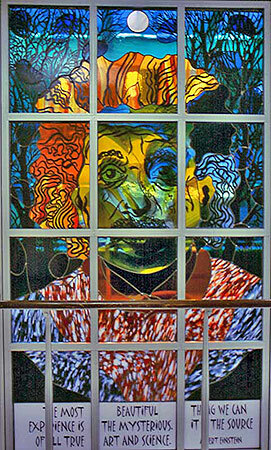 My goal is to show that stained glass can be contemporary modern art. I design and construct all my own work. I welcome commissions. Pricing is dependent on the size and complexity of the job and the glass used. Stained glass can be used in interior locations with proper lighting as well as in windows. Please contact me if you would like to discuss a commission and see my website for other examples of my work.